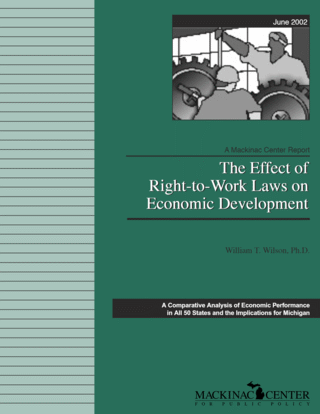 Critics of RTW legislation have often acknowledged the faster employment growth in RTW states, but counter that it comes at the expense of much lower wages and incomes. Organized labor's mantra, the "right-to-work for less" or the "right-to-starve," has resonated strongly both inside and outside union circles. Most economic studies have shown higher nominal or money income in non-RTW states. Chart 9 confirms that this is still the case. Per-capita disposable income, the per-person income available for spending and saving after paying taxes, was approximately 10 percent higher in non-RTW states in 2000. Besides evidence of greater purchasing power or higher living standards in the RTW states, there is also hard evidence that the nominal income gap between RTW and non-RTW states is narrowing. As shown in Chart 10, per-capita disposable income grew 0.2 percent faster annually for RTW states over the 1970-2000 period. So while non-RTW states have traditionally held a lead in nominal income, this gap continues to narrow. Disposable income is growing faster in RTW states because they have a flexible work environment in which employers and employees can more easily respond to market incentives. This produces lower costs, higher productivity, and greater income and job growth. Businesses increasingly reject "top-down" management, relying instead upon employee participation in every aspect of a firm's decision-making process. This inevitably favors a work environment that is more responsive to the changing needs of both workers and employers. Employees protected by RTW legislation can quit supporting a union without quitting their job. Reid and Faith (1987) find that unions in RTW states reward members more equally and are less concerned with day-to-day administration of complex bargaining agreements. This makes collective job actions more difficult and prompts local union leaders to strive more for consensus among their members. Right-to-work legislation forces a union to bargain more in the immediate interest of all members because members can withdraw from a union at any time without cost to themselves. Rigid union-negotiated employee contracts typically have the perverse effect of reducing the pay of the most productive workers while increasing compensation for less productive workers. Any system that grants union officials the legal power to impose unwanted union representation on its most productive workers, and then forces them to pay for it, ultimately lessens the income and standard of living of all its citizens. Michigan, ranking fourth in the nation in private-sector union membership (as a percent of the private workforce in 2001), matched the non-RTW state average in disposable income growth.